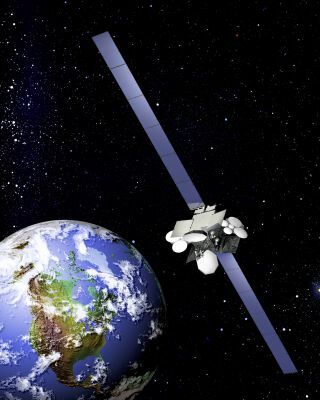 An artist's illustration of the Anik F2 telecommunications satellite in orbit. The Anik F2 satellite launched in 2004 and is operated by Telesat Canada. A company that's developing inflatable satellite components won the $100,000 grand prize in a space business contest Saturday (July 28). Space Ground Amalgam, LLC took home first place in the 2012 NewSpace Business Plan Competition, which seeks to help startup space firms create potentially game-changing technologies. The Virginia-based company beat out nine other finalists for the NASA-funded prize, which was announced Saturday night at the NewSpace 2012 conference awards gala in Santa Clara, Calif.
Space Ground Amalgam builds inflatable parts — such as reflectors, booms and solar arrays — that could decrease satellites' size and weight while helping them meet high bandwidth demands, company officials said. The firm hopes to help outfit telecommunications satellites, as well as spacecraft run by NASA, the military, industry and academia. Space Ground Amalgam is seeking a total of $3.5 million in funding, officials said. Nevada-based Digital Solid State Propulsion, LLC, which is working on new "green" solid-state propellants that can be switched on and off using only electrical power, won the $10,000 second prize. The Texas company Terapio Corporation received an honorable mention for its plan to devise bioengineered therapeutics that could help mitigate the effects of radiation exposure in space or on other worlds. "All three of the winners provide key disruptive technologies and are outstanding candidates for institutional funding," Thomas Atchison, one of five competition judges and chairman of the Mavericks Civilian Space Foundation, said in a statement. "These companies, their products, technologies and services will bring down the barriers to commercial activity in space." The 10 finalists presented their business plans to the NewSpace 2012 conference on Friday (July 27), after polishing them for the previous two days during a "boot camp" run by space industry professionals and investment experts. This year's prize represents a big monetary step up from last year, when the top award of $25,000 went to Altius Space Machines for its "Sticky Boom" technology, which could make space docking and rendezvous operations easier. Space technology advancements like NASA's Robonaut 2 (left) can help humanity launch more ambitious space exploration missions. The NewSpace Business Plan Competition will continue trying to nurture promising space startups into the future, officials said. "This competition is becoming the premier event for finding investment opportunities and deals related to disruptive technologies of the future," said competition judge Eva-Jane Lark, vice president of the investment firm BMO Nesbitt Burns in Canada. "I recommend all institutional and angel investors look to the 2013 NewSpace Business Plan Competition for more innovative technologies to consider."